Amidst a rash of high-profile setbacks, he’s just played a blinder. What little remained of President Barack Obama’s gun control legislation has been unceremoniously buried by the gun manufacturers, in cold-blooded disregard for the funerals for 20 children slain at Sandy Hook. This, hard on the heels of a Republican-dictated budget heaping yet more hardship and pain on the poorest Americans. Such action is crucial both to contain climate change and to set the kind of powerful example that can inspire the world. The Climate Change Working Group will be led by United States special envoy for climate change, Todd Stern, and Xie Zhenhua, vice chairman of China’s National Development and Reform Commission. In July, they will present a report to the United States – China Strategic and Economic Dialogue, established by President Obama and President Xi Jinping’s predecessor in 2009. In 2006, China overtook the United States as the world’s biggest carbon dioxide polluter. No end of ill-conceived Kyoto-style protocols was ever going to make a blind bit of difference without the world’s top twin polluters. Only by redirecting the rampant, aimless consumerism of the United States—fossil-fueled offshore in China—while simultaneously reducing population, can greenhouse gas emissions be rapidly reduced. Fortunately, the Chinese administration is strongly motivated to reduce fossil fuel use on three counts: Firstly, ‘airpocalyptic’ air pollution is killing Chinese citizens in unprecedented numbers—1.2‍ ‍million in 2010. Despite outward appearances, the People’s Republic is extremely wary of people power—power could swiftly be wrested from the presiding administration, should it be perceived as indifferent to the burgeoning death toll. Secondly, China, unlike the United States, has never demeaned itself with phoney debates about the existence or cause of anthropogenic global warming. 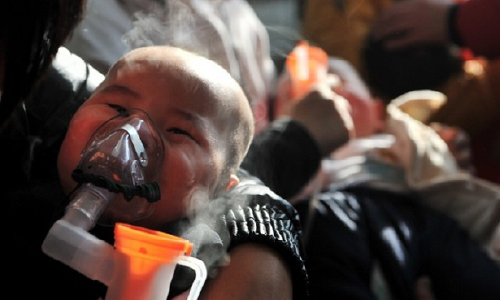 China knows full well that climate disruption will savagely impact its people. Finally, China recognises that its vast energy needs can be more economically and cleanly met by rapidly ramping up its nuclear power generating capacity. The escalating coal consumption of its coastal provinces so outstripped the ability of rail networks to supply domestic product from China’s coal-rich northern and western regions that in nine years the country flipped from being the second largest exporter, in 2002, to the largest importer, overtaking Japan. In turn, Japan is being chased by India, but by 2017, China will be burning more coal than the rest of the world put together. Only with Chinese and the American scientists and engineers working shoulder to shoulder on a Liberty Ship ‍–‍scale production of small modular and fourth-generation power plants, is there any prospect of sufficient coal being left undisturbed for runaway—or mini-runaway, by one definition—global warming to be averted. While planet-saving use of nuclear is guaranteed deeply offend the sensitivities of many, unlike photovoltaic panel technology, it will make a measurable difference as to how quickly global temperature rises, and to the prospects for survival of billions. Not that photovoltaic is likely to be completely left high and dry—panels are a huge, and heinously polluting, export business for their largely unregulated Chinese manufacturers. The world’s biggest consumer and biggest producer of consumables are economically joined at the hip. 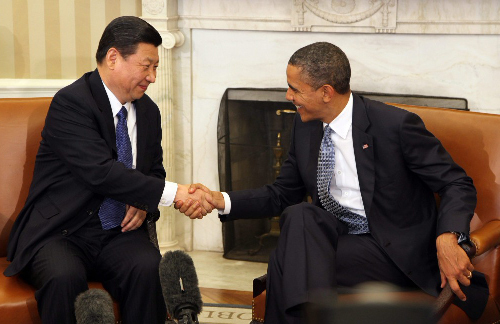 As of January, the United States owed China $1.26‍ ‍trillion. The United States would dearly love China to allow its currency to float further to allow the former to inflate its way out of the bind it has squandered its way into. Fortunately for this finite planet, China’s newfound enthusiasm for capitalism has its limits, and United States consumerism has been reined in. Meantime the United States economy languishes, with one in 10 Americans out of work. If the United States was a functioning democracy, out-of-work Americans would immediately be put to work in a latter-day Civilian Conservation Corps with the priority being the installation of smart meters. And in fact it is one of the few things that conservative and liberal commentators agree on, this idea of a time before the fall, a golden age in Washington when, regardless of which party was in power, civility reigned and government worked. The inertia of the climate system is not our friend. Because climate responds slowly, we have felt so far only about half of the effect of gases already in the air. This limited response makes it easier for people to believe that we are exaggerating the climate threat. The national debt of the United States nudges US$17‍ ‍trillion; and world debt tops US$50‍ ‍trillion. So all the world’s children are expected to pay for the unsustainable lifestyles of their parents and grandparents, while also paying to replace the 81% of the US$7‍ ‍trillion per year global energy sector that is currently fossil fueled, while moving millions, and ultimately billions to higher ground, while feeding potentially twice as many mouths from a fraction of the arable land. If the superpowers mobilise now, there is a fighting chance of a halfway liveable climate being salvaged. However, that mobilisation must include an almost complete moratorium on breeding, otherwise no end of fast-breeder nuclear power plants will help feed any number close to even today’s seven billion, in the face of desertification that is already costing the global economy US$0.49‍ ‍trillion annually. Scientists estimate the situation will be worse in 2050, when sea levels may rise up to 200‍ ‍mm and submerge about 87‍ ‍000 square kilometers of coast, the [State Oceanic Administration] report warns. It is just possible, but highly unlikely, that China has an equivalent of the North Carolina Senate, which legislated against sea-level rise projections greater than ‘historic trends’. 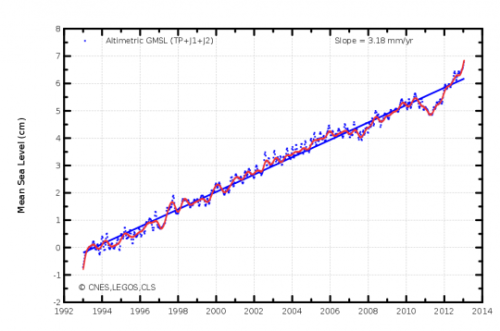 It must be noted, of course, that the 20‍ ‍millimetre uptick in global sea level since mid-2011 is on the back of a decent downtick that began in early 2011. It is, however, only a matter of decades before 100-millimetre-per-decade sea-level rise will, briefly, be the new normal. Aotearoa, once it dumps its current neoliberal ideologues out of office, is perfectly positioned to be a climate action trailblazer for the superpowers. Its formerly impeccable renewable energy credentials are within easy reach of redemption, provided Rio Tinto doesn’t succeed in extorting ever more subsidised power, beyond the period of the current shameless contract. The country could quickly become a global showcase for clean energy and low-energy lifestyles. But rather than concentrating on attracting emissions-spewing turbulence-buffeted planeloads of wealthy Chinese tourists, Aotearoa, along with Australia, should be establishing a transport corridor featuring fast nuclear-powered ferries and bullet trains—the Australians, at least, are earnestly planning for the latter. But, as alluring as a new era in civilised travel may be, long-distance journeys of the future will never be as casually available as the present, where airliners are allowed to pump carbon dioxide into the most vulnerable layer of the atmosphere without paying a cent by way of compensation. Aotearoa will need to provide a much deeper experience, whereby the relationship with its visitors is a much longer affair, only small part of which would involve physical travel. In fact a ‘visitor’ may never set foot in Aotearoa, but wear its wool with pride, celebrate milestones with its roast lamb, and make and keep lifelong friendships there. China is synonymous with coercive population control. While the inhumane methods it has sometimes employed can never be condoned, nor can the necessity to defuse its once explosive population growth rate be denied. Had China continued to average five children per woman, as it did in the early 1970s, the famines that had repeatedly stalked the country would have continued to extract their cruel toll. Although the 1958–1961 Great Chinese Famine that killed as many as 43‍ ‍million was largely state-inflicted, without government measures, including its one-child policy, China’s population might now be 400‍ ‍million greater. 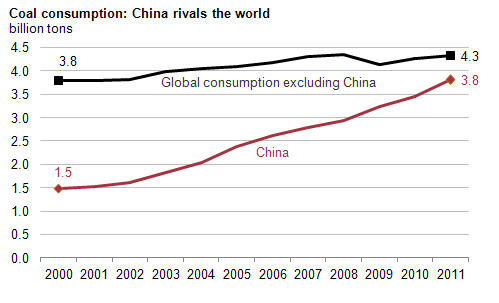 As it is, China’s population is growing by nearly seven million per year. That, combined with rapid per-capita increases in energy consumption and growth in manufacturing, drives China’s eclipse, from 2006, of the United States as the world’s number one greenhouse gas emitter. The CIA World Factbook ranks China’s 2012 population growth rate 152nd, the United States is ranked 28 positions higher at 124th. While the United States is adding only a third as many souls per year as China, a more than four times greater per capita greenhouse gas emission profile means that the United States’ extra two millions per year are probably contributing more emissions than China’s extra seven. Bizarrely, emissions created producing goods in China for consumption in the United States are counted solely as Chinese emissions, so Americans are still the greater polluters, despite claiming recent reductions down to 1992 levels. Most population growth discussion in the United States appears to focus on the country’s more than one million immigrants per year, and the higher birth rate among new immigrants. So when moratorium is mentioned, particularly post the Boston bombings, it invariably refers to immigration, rather than the near global moratorium on births that is needed to avert widespread famine that is otherwise unavoidable, as warming impacts a population already many times that which is sustainable. First we go on growing our emissions at the current rate (3 per cent per year) for the next couple of decades, and the fossil fuel industry thrives. Then, when it’s already too late and we have crossed the +2 degree limit, the actual warming (which always lags the growth in emissions by a decade or more) frightens us into taking action at last. So we lurch into a crash programme to cut fossil fuel use—and suddenly the market wakes up to the fact that a lot of those reserves will have to stay in the ground forever. If you liked the sub-prime mortgage fiasco in 2008, you’ll positively love this one. It’s not either Disaster A or Disaster B. It’s first one then the other, interlocking and mutually reinforcing. And Disaster B will mean there’s no money left to do anything about Disaster A. Although many will struggle to believe that the United States is capable of ‘large-scale cooperative action’, those who care about the ‘consequences for a large part of the human race’, and a large proportion of its fellow species great and small, must find the audacity to hope. And Aotearoa and Australia must swiftly become allied in this ultimate sacrifice, and honour all the brave soldiers who cannot get older by fighting tooth and nail for a survivable population and climate. Dawn of an Anzac struggle more desperate than Gallipoli. I dropped the USA off my Christmas card list when their president lied about weapons of mass destruction in Iraq.